This was great for Middlesex as it was showing how we were strengthening our Values and our Mission by supporting and collaboration. We were educating our next generation on Sustainability and ethical sourcing. But Jo felt there was still a wider opportunity to raise awareness of the University’s work and what this meant. Fairtrade Foundation and the National Union of Students teamed up and started to look at how Universities and colleagues obtained Fairtrade status - they concluded it could be a lot better, more challenging, and more educating. 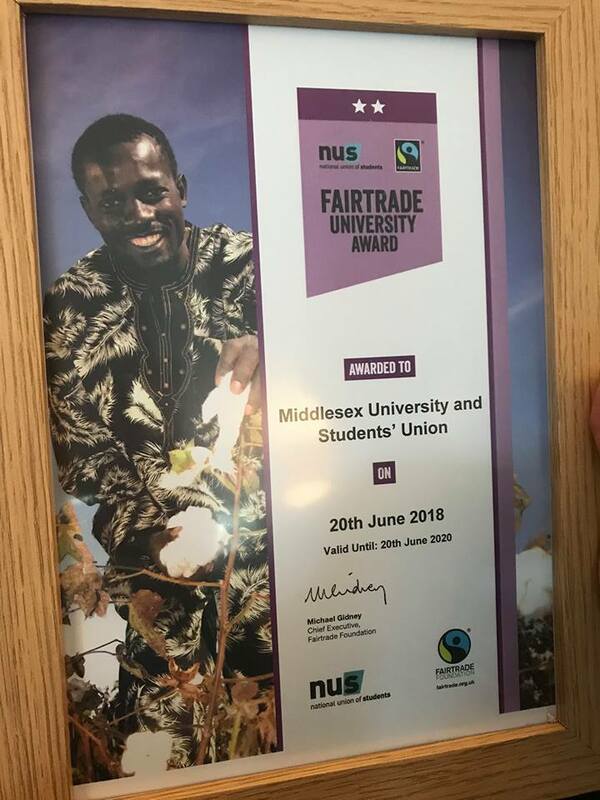 So they decided to form a Pilot Scheme, and Middlesex was chosen as one of 12 universities (out of 27 total put forward to take part) to help form the improved standards for the Fairtrade Awards. These standards would then be set for the rest of the UK. Middlesex is currently one of 4 universities that have achieved the highest award level so far, of 2 stars. “The enthusiasm and passion for the job was really felt throughout the course of our conversation with lead contact. It is both reassuring and refreshing to know that the goals and policies of the Fairtrade association will be sure well represented at Middlesex”. Middlesex will be continuing efforts towards Fairtrade, Sustainability and Ethical Sourcing, in hopes of continuing to educate our students on the importance of these matters. Joanna Milis, Education Campaigns Manager from the Fairtrade Foundation, has said regarding the pilot: “Research conducted by our partners NUS tells us that 90% of students say they want to buy more products that don’t harm the people that produce them and 84% say they trust the Fairtrade Mark the most of all product marks. There is a huge appetite amongst students to understand the impact the products they buy are having on the people and the planet along the supply chain, and to buy ethically sourced products. It is so important to enable students to have access to information about this at a time when there are forming their values and habits for life. Working in partnership with NUS and the pilot institutions has allowed us to develop a robust but achievable set of standards for the revised award. The pilot cohort of worked incredibly hard and with great enthusiasm and we thank them for their support”.